Every restoration project involves various levels of grit, determination, gumption and doggedness. But [Darren Glen]’s restoration of a Jupiter-8 is an absolute labor of love. The Jupiter-8, launched by Roland in 1981, was their flagship “polyphonic analog subtractive” synthesizer and was used by many legendary acts of the ’80’s. The synthesizer was rugged — built to withstand the rigors of travelling everywhere that the bands took it. More importantly, it could produce a wide range of sounds that came from dedicated and independent controllers. These, plus a host of other desirable features, makes the synth highly coveted even today and the rare ones that surface for sale can be quite expensive. The back story of how he came in possession of this coveted, albeit non-functioning, piece of history is a good read. But the part that makes us all interested is the meticulous restoration that he is carrying out. There is a lot of useful information that he shares which could be handy if you are planning any restoration project of your own. When he first turned it on, all he got was an “8” on the display — which seemed like an error code. From then onward, he has been carefully stripping away each part and slowly bringing it back to life. All of the linear slide potentiometers and slide switches were de-soldered, dis-assembled, cleaned of rust and the carbon tracks and contacts cleaned with special spray — making them almost as good as new. The transformer and its mounting brackets received a similar treatment of rust cleaning and fresh paint. All of the other internal metal parts, such as the chassis, were restored in a similar fashion. White plastic buttons and knobs which were faded, were brightened up by spraying them with a generous dose of hydrogen peroxide hair spray, putting them in Ziploc bags and letting them bake in sunlight for a day. [Darren] was satisfied enough with this process and gave the same treatment to all the other colored buttons too, with good results. The other set of plastic parts – the keyboard keys, were cleaned and polished with a scratch and blemish polish cream, and replacements were ordered out from a specialist supplier for the few that were damaged beyond repair. But by far the greatest challenge for [Darren] has been resurrecting the top metal cover. It was badly rusted and had to be completely stripped of all paint. Repainting it the right shade was relatively easy, but applying the legend and decals took him to every screen printer in town, none of whom could manage the job. He lucked out by locating a screen printer who specialized in custom automotive work and managed to do a pretty good job with the decal work. The Z80 microprocessor had lost all its magic smoke, so [Darren] has ordered an original Zilog replacement which will hopefully clear the error he noticed when it was first turned on. He’s slowly working his way through all the issues, and it is still work in progress, but we look forward to when it’s all done and dusted. A fully functional, restored Roland Jupiter-8 — one of the first 500 that were built back in 1981 — resurrected with a lot of TLC. A big shout out to [Tim Trzepacz] for bringing this project to our notice. [Ben]’s project consists of a series of brass plates wired to capacitive touch breakout boards from Adafruit, one for each of the Arduino Mega clone’s four I2C addresses. When a key is touched, the Arduino sends a key down signal to the Werkstatt while using a R-2R ladder to generate voltage for the VCO exponential input. 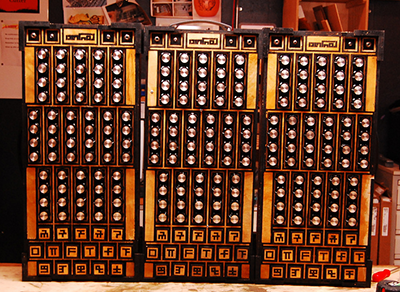 The most recent Moog Hackathon was the third. Twenty-five teams competed from Georgia Tech alone, plus more from other schools, working for 48 hours to build interfaces with Moog Werkstatt-Ø1 analog synths, competing for $5,000 in cash prizes as well as Werkstatts for the top three teams. We’re synth-fiends here on Hackaday: we cover everything from analog synths to voltage controlled filters. Via Freeside Atlanta, photo by [Nathan Burnham]. [Russell Kramer] made our day today. We’re tremendous fans of minimalism in electronics design, dirty noise hacks, and that old NES light gun. He’s posted up a project that combines all three to make a light-gun controlled, VGA video display that makes bleepy-bloopy noises to boot. Check out the video below! To appreciate this hack, you really need to read through the project logs in detail. Start with the VGA signal creation, for instance. The easiest way to go these days is to throw a microcontroller at the problem. But because he’s done that to death, [Russell] takes a step back thirty years and generates the sync pulses periodically with a relaxation oscillator and a binary counter IC. The rest of the build follows this aesthetic choice: everything is op amps and CMOS logic. The rainbow effect, for instance, is created from the audio signal through a three-stage, 120-degree phase-shift oscillator sent to the R, G, and B channels. Kudos! The high-level overview is that the light intensity and position hitting the gun’s sensor is converted into a voltage that drives an audio-frequency oscillator. This audio output is then piped back into the video generator. Watching the video, it’s obvious that pointing the gun at different parts of the screen changes the pitch, but playing a given pitch is nearly impossible on this thing with all the feedback going on. [Russell] added a bit of more control into the system — when the gun’s trigger is pulled, it registers full-brightness regardless of the video input — but even so, we’d be hard-pressed to play “Mary Had a Little Lamb”. But that’s not the point. The point is awesome, light-gun-waving noisy madness set to a responsive colorful video background. And that’s been achieved in spades!